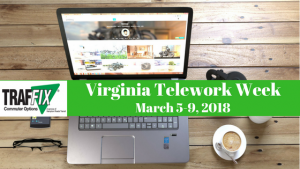 This week we celebrate Telework Week and encourage employers to learn more about teleworking as an employee benefit. Teleworking offers benefits to employers and employees with an increase in productivity, improved moral, its cost-effective and eco-friendly! “As a supervisor for a company that has a Telework Program, I’ve seen and appreciate the benefits that it offers. I have certain staff that work on Saturdays and Sundays. This has provided a flexible work schedule for my team on the weekdays and allows them to handle things in their personal lives that they wouldn’t typically be able to take care of on a Monday-Friday schedule. It also saves them time in traffic and gas to be able to work from home. We’ve had staff telework for over 10 years now and it has boosted the staff morale. As a supervisor in a production environment, I really appreciate this program as it allows my team to balance workflow throughout the weekend,” says Chris DeJesus, Operations Supervisor for Kantar Media.